A rendezvous is a temporal and spatial vicinity of two sensors. 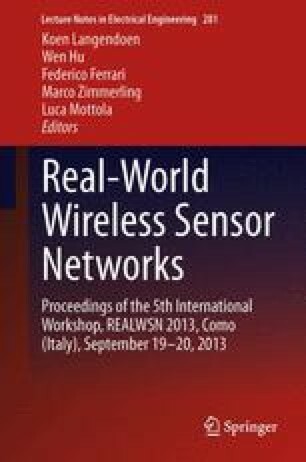 In this chapter, we investigate rendezvous in the context of mobile sensing systems. We use an air quality dataset obtained with the OpenSense monitoring network to explore rendezvous properties for carbon monoxide, ozone, temperature, and humidity processes. Temporal and spatial locality of a physical process impacts the number of rendezvous between sensors, their duration, and their frequency. We introduce a rendezvous connection graph and explore the trade-off between locality of a process and the amount of time needed for the graph to be connected. Rendezvous graph connectivity has many potential use cases, such as sensor fault detection. We successfully apply the proposed concepts to track down faulty sensors and to improve sensor calibration in our deployment. We would like to thank Tonio Gsell and Jan Beutel for their technical support. Further, we thank Roman Lim, Federico Ferrari, and the anonymous reviewers for their valuable feedback that helped us to improve this chapter. This work was funded by NanoTera.ch with Swiss Confederation financing.